It won’t be my words today, but a post from someone else…and all I ask of you is to go to the site and vote! We Need Your Help this Mother’s Day! This year for Mother’s Day we would like to honor our mom, Debbie Lyons-Blythe, as National Farm Mom of the Year. This title is determined by voting so we need your help. You may know Debbie Lyons-Blythe as a blogger, rancher, and advocate. We know her as “Mom.” Parents often brag about their children, but let us reverse roles and tell you about how proud we are of our mom’s accomplishments. I asked my four younger siblings and Dad to describe her. Over and over again I received the same answer… unselfish. Mom is unselfish. All of her efforts are focused on giving to something bigger than herself. She shares her story in blogs for the agriculture industry. She wakes up early and works long hours for our cattle ranch. She serves the Kansas Angus Association and National Cattlemen’s Beef Association in leadership positions for the advancement of the beef industry. She volunteers for our community, and she goes above and beyond for our family. Mom embodies the spirit of American agriculture, and demonstrates the beauty of sacrificial love through the giving of her talents, her time, and of herself. 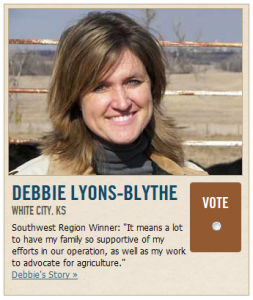 Please visit http://www.americasfarmers.com/farmmom/vote.aspx to cast your vote for our mom, Debbie Lyons-Blythe. Don’t forget to complete the voting process by entering your name and email address! And please pass along mom’s story and the information to your friends as voting closes May 12th. Thank you for helping us out with this Mother’s Day honor. We really appreciate your support! Head over to http://www.americasfarmers.com/farmmom/vote.aspx and vote! Now, just to clarify…I know Debbie. I’ve met her, I’ve had coffee with her and I admire her, look up to her and have thoroughly enjoyed getting to know her, both online and in real life. She’s an amazing woman with amazing energy, and I know that if she’s survived the craziness that’s her life, then I can too. But that’s just my opinion. Check her out on your own…but I think you’ll find the same thing. Good luck, Debbie! You deserve the recognition, and I’m proud to call you a friend. This entry was posted in Agvocacy, Farm life, Projects, Wordless Wednesday and tagged agriculture, agvocacy, farm life by wagfarms. Bookmark the permalink.